Last year Jay took 5th place in the KBS (Kayak Bass Series) national kayak bass tournament. He also took 1st place in the 2016 Minnesota Kayak Fishing Association 3 species tournament, where the goal is get the most cumulative inches based on your biggest Bass, Walleye and Northern Pike. A big Northern Pike is crucial in this tournament, so today we’re going to talk about big fish in regards to kayak fishing. What advantages do Hobie Kayak anglers have when they hook in to, need to play and land a large fish? Jay: Fighting big fish like pike, musky or sturgeon presents a unique set of challenges. 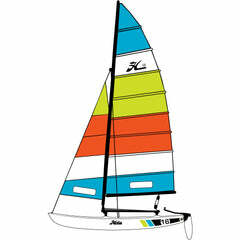 Hobie Fishing Kayaks offer 3 distinct advantages over other kayaks. The first is stability. 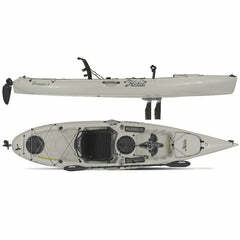 When you're targeting fish that can tow you around you need to be fishing from a stable kayak. Often times you'll find yourself in a 360 degree battle, meaning that fish may be pulling you backward, sideways, or any other way. It's nice to have confidence in that situation. The second advantage is being able to chase a fish if I need to. I've never had a big pike come close to spooling me. It's just not that kind of battle but I don't like to let them take too much line if I can help it. It's hard to control the fish. With sturgeon you definitely need to chase them. 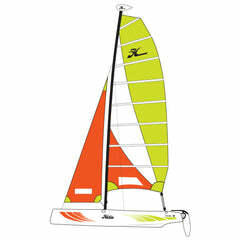 The third thing is something new from Hobie and I'm really excited about it; Mirage drive with reverse. Now when a fish is pulling me toward cover I can pull the reverse cable and back away. That's going to be a game changer! 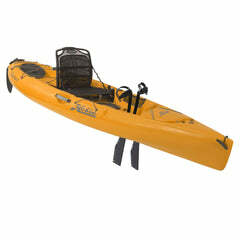 How do specifically rig or what accessories are a must haves for those that want to target big fish from their Hobie kayaks? Jay: I like to have fish grips as well as a net that's the right size for the species that I'm targeting. I always cut the net handles down to a size that's easily manageable in a kayak. Also, It (the net) has to be something you can use with one hand. Lowrance electronics are also a must have. Plus, I always carry a Rapala 59 inch measuring board and a camera too. What rod, reel and tackle do you use most often when you’re specifically targeting big toothy fish? It depends on the weight of the lure. For lures under 3/4 oz I like a 6' 9" medium heavy St Croix Avid, a Daiwa Tatula bait cast reel, 30 lb suffix 832 braid and a hand tied 60 lb fluoro leader. For lures over 3/4 oz I use a 6'6" heavy action flipping stick with the same reel, line, and leader combo. One last question, tell us about your most memorable experience with a big fish from your Hobie Kayak? Jay: Last spring (2016) in northern Wisconsin I was fishing some riprap near a bridge. I was throwing a little square bill and the bass rod just loaded up. I could tell right away by the steady slow tow that it was a big fish and likely very toothy. I backed off on the drag and took my time. Several long minutes later I was able to get 2/3 of a 46" musky in my little bass net, grip the tail and hoist the fish into the yak. A picture of this fish accompanies this story. What a thrill from a kayak! Thanks Jay! We look forward to seeing pics and videos from your 2017 season. 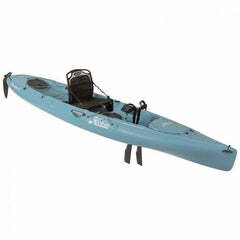 What’s The Best Fishing Kayak For Big And Tall Guys? 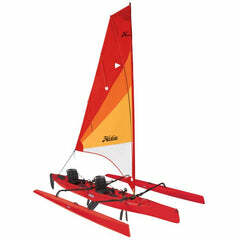 Is the Hobie Mirage Drive 180 the best propulsion system for fishing kayaks? 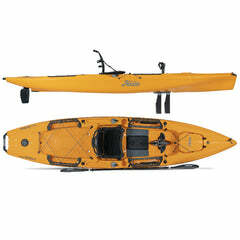 Can You Stand And Fish From A Hobie Outback Kayak? Is Kayak Fishing Safe For A Person 50 Years Old Or Older? 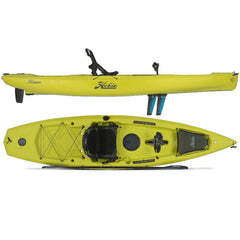 Is The Hobie Pro Angler 14 The Best Fishing Kayak? Is The Hobie Outback A Good Fishing Kayak? 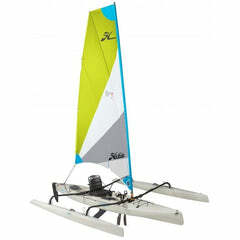 Are Hobie Fishing Kayaks The best? Hobie Kayak Helps Take The Top Spot In An MN Three Species Tournament! 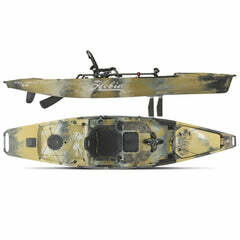 Do Hobie Fishing Kayaks Give You An Advantage In Tournament Fishing? 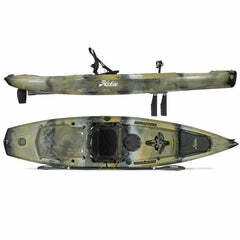 How Important Is A Comfortable Seat For Kayak Fishing?